The last time Tess de Vere saw William Benson she was a law student on work experience. He was a twenty-one year old, led from the dock of the Old Bailey to begin a life sentence for murder. He'd said he was innocent. She'd believed him. Sixteen years later Tess overhears a couple of hacks mocking a newcomer to the London Bar, a no-hoper with a murder conviction, running his own show from an old fishmonger's in Spitalfields. That night she walks back into Benson's life. The price of his rehabilitation - and access to the Bar - is an admission of guilt to the killing of Paul Harbeton, whose family have vowed revenge. He's an outcast. The government wants to shut him down and no solicitor will instruct him. But he's subsidised by a mystery benefactor and a desperate woman has turned to him for help: Sarah Collingstone, mother of a child with special needs, accused of slaying her wealthy lover. It's a hopeless case and the murder trial, Benson's first, starts in four days. The evidence is overwhelming but like Benson long ago, she swears she's innocent. Tess joins the defence team, determined to help Benson survive. But as Benson follows the twists and turns in the courtroom, Tess embarks upon a secret investigation of her own, determined to uncover the truth behind the death of Paul Harbeton on a lonely night in Soho. 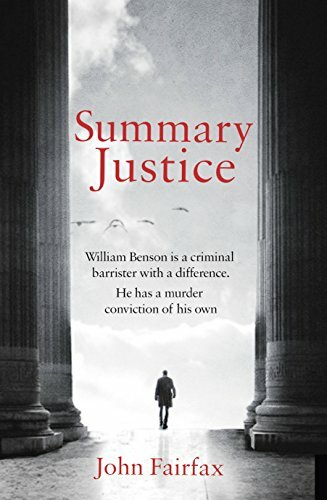 True to life, fast-paced and absolutely compelling, Summary Justice introduces a new series of courtroom dramas featuring two maverick lawyers driven to fight injustice at any cost. I liked the concept of this book, Summary Justice, by John Fairfax. The introduction was good with Will Benson being sentenced to life for a murder he maintained he did not commit. Hearing him restate this is Tess de Vere a nineteen year old trainee solicitor. She believes him. After Will is released on parole, having admitted to the murder, Tess comes across him again. In that time their lives have taken very different paths in some ways though maybe not in others. The scene is well set. To start with I found the style mostly quite light and easy. There is some humour in places as Tess meets up with her old friend Sally. There is even some humour for Will now outside prison but only on parole. However under this there is a feeling of things that might go wrong. Up to about 30% in I found this book perfectly readable however it didn’t feel like it was going to be memorable or grip me. After that I found out just how wrong I was! I do prefer not giving things away in reviews so I’ll just say that a trial starts and the tension grows in a number of ways. The book became increasingly readable and far harder to put down. The story takes on a very twisty feel and the courtroom dramas are well played out to me. I did find this straying briefly into the marginally incredible but it is worth it for the twists. The characters are well worked and believable. The pace later on is very good. I’d say I liked the ending but of course the story hasn’t really ended yet has it… So I’ll close with the fact that I want to read John Fairfax’s next book in this series – I do hope he can maintain the very good start made her. Maybe 4.5/5 by the later part of the story but a very good read overall.